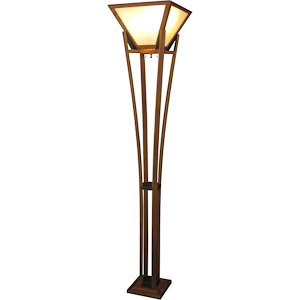 The Arundel Floor Lamp provides a unique lighting technique of a soft diffused light shining through Shoji Rice paper and the indirect lighting effect from the light shining upward. The gentle flowing curved Cherry wood posts support an inverted shade also crafted from Cherry with a re-enforced rice paper. The lamp as shown uses Black Walnut accents support the shade, base and legs. A dual socket with pull chains is provided for two 100 watt light bulbs using only LED or CFL (Compact Fluorescent Lamps) to minimize the heat. A 10 foot is cord eliminated the need for an extra extension cord. Please specify main wood (base, shaft, shade) and accent wood. Note: WOOD types are Maple, Cherry, Walnut or Tiger Maple.